Grand Canyon University is Arizona’s premier, nonprofit, private Christian university committed to delivering affordable, transformative education. GCU’s nine colleges offer more than 200 academic programs, including over 150 online academic programs. 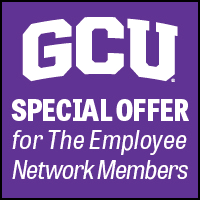 GCU is proud to offer an up to $750 Scholarship Off Tuition for Employee Network members who are eligible. Must ask for The Employee Network discount and present your physical or digital Membership Card during enrollment.